Many have hailed the midterm elections as a victory for the Tea Party. The dramatic Republican Party gains in the House, the increasing self-identification of voters as “conservative,” and the widespread disillusionment for politics as usual seem to show that the Tea Party revolt has captured the nation’s zeitgeist. However, while observers have gone to great lengths to divine what this new movement might mean for U.S. domestic politics, less analysis has gone into understanding the significance of the Tea Party on the politics of U.S. foreign affairs. This comes as no surprise—Tea Partiers, particularly those at the grassroots level, have voiced few positions on international issues. Nevertheless, the emergence of this new political force will impact the national discourse on foreign policy. A case in point is the sharp contrast between what appear to be core Tea Party beliefs and those of the neoconservatives, the political faction most closely associated with the drive to attack Iraq and a vanguard force in hawkish policy discourse. While some commentators, like former George W. Bush speechwriter Michael Gerson, have argued that the rise of the Tea Party will lead to a “Jacksonian shift” in foreign policy discourse (led by “heavily armed realists” who scorn multilateralism), the isolationist tendencies of many Tea Partiers would appear to belie such an analysis, and present a direct challenge to the militarist go-it-alone internationalism of the neocons. These tactics can be grouped into several categories: strategic flattery from national media platforms; offers of technical advice (speechwriting, debate preparation); prominent placement of op-eds; appearances at Tea Party gatherings; subtle and not so subtle encouragements of anti-Muslim bigotry; and advocacy efforts such as circulating petitions to put congressmen on record as supporting a “strong America.” In addition, neocons are busy influencing the congressional staffing process and networking operations on Capitol Hill—both areas they excel at—to help shape the new class of politically inexperienced Tea Party lawmakers. McCain enlisted influential neoconservative Randy Scheunemann as a policy advisor, and in turn Scheunemann brought on Steve Biegun as her chief foreign policy staffer. Palin’s previous foreign policy pronouncements had been vague and scattered, but she became an eager student. She made hawkish noises during the campaign: while she spoke more loosely than expected about the possibility of war with Russia, she forthrightly supported an Israeli strike on Iran. Despite efforts by paleoconservatives to reach out to her and provide some counterinfluence, she stayed on message—which would have considerable significance as she became a political star in her own right. Palin was a difficult fit for many neoconservatives, who tend to be highly educated and urbane. The same held true for American Jews. In January 2010, Commentary explored the gap. Jennifer Rubin’s “Why Jews Hate Palin,” described the Alaskan as a national Rorschach test: she was viewed either as an exemplar of anti-elitist common sense and moxie, or as irredeemably anti-science and anti-intellectual. Most Jews, and no small number of neoconservatives, held the latter opinion. Ken Adelman, a prominent neocon who headed the Arms Control and Disarmament Agency under President Ronald Reagan, said she was not qualified to hold a mid-level post there, much less serve as vice president. But her readiness to represent neoconservative positions gave her staying power. Norman Podhoretz, Commentary’s retired editor, positively likened Palin to Ronald Reagan in a Wall Street Journal piece, reminding conservative readers that Reagan was no great intellectual either. Weekly Standard editor Matthew Continetti rendered a flattering portrait of her in his book, The Persecution of Sarah Palin, which portrayed Palin as the victim of unfair “elitist” media. For the neoconservatives, this alliance has paid off. Palin has become the neoconservatism’s reliable vector into the Tea Party world. She reliably echoes neoconservative talking points about war with Iran. When addressing the Tea Party Convention in Nashville last February, she hit neocon talking points by citing Ronald Reagan, “peace through strength,” and “tough action” against Iran. She declared that the United States needed a foreign policy that “reflected our values” and denounced the alleged policy of treating terrorism as “a mere law enforcement matter.” Wearing an Israeli flag pin, she charged that President Obama was causing “Israel, our critical ally” to question our support by reaching out to hostile regimes. In addition to policy guidance, neoconservatives have positioned themselves as an ally of the movement by flattering it. Weekly Standard editor Bill Kristol is a noteworthy example. In two recent columns, Kristol has rhetorically embraced the Tea Party, while at the same time making clear that he was not really on the same plane as people who wear Revolutionary War costumes at their rallies and decry Obama as a totalitarian socialist. In July, he wrote an editorial telling Republicans to “fear not the Tea Parties” and to be open to their bold and impractical proposals—belt tightening and program trimming are not enough to get hold of the budget deficit. Kristol didn’t actually endorse any Tea Party proposals, merely the spirit of them. Until a new Congress convenes, there won’t be battles over the budget. Palin, the most prominent national politician with “tea party bona fides,” will argue for holding constant or increasing military spending. Incoming new congressmen will be greeted with entreaties to sign a “Peace through Strength” platform. Didn’t the Republicans running for office already have a “Pledge to America”? They did, explained veteran neoconservative operative Frank Gaffney. But the Pledge to America, unveiled in late September by the House Republican leadership, “treats the Constitution’s obligation to ‘provide for the common defense’ as a kind of afterthought.” Only two of its 45 pages were devoted to defense and foreign policy. In response, Gaffney and other neoconservatives produced their “Peace through Strength” 10-item platform, which calls for “a nation free of Shariah,” keeping Guantanamo open, and a foreign policy that “supports our allies and opposes our adversaries.” While the hawkish document has not yet attracted many GOP signers, early ones included Tea Party-associated Senate candidates Mike Lee of Utah (he won) and Christine O’Donnell, as well as seven current GOP members of Congress, including House Tea Party caucus head Michelle Bachman. Two Tea Party leaders, Judson Phillips of Tea Party Nation and Amy Kremer of Tea Party Express, have also signed. A telling plank in the Peace through Strength platform is its “nation free of shariah” proviso. Neoconservatives hope to increase fear of Muslims by linking the use of the word “shariah,” which is Muslim law, to “terrorism.” Both Gaffney and former House speaker Newt Gingrich, have made fear of shariah a centerpiece of their outreach to the Tea Party and the populist right. Last month Gaffney and colleagues from the Center for Security Policy released a so-called Team B report entitled Shariah: The Threat to America. It made some incredulous claims about Islamic law, like that all Muslims are duty bound to wage jihad against unbelievers. When questioned by reporter Matt Duss, Gaffney acknowledged that he had consulted with no actual Muslims or experts on Islam in preparing the document. Since 9/11, Islamophobia has been on the rise in the United States, and recent months have seen the tendency explode—witness the opposition to the so-called Ground Zero mosque. While the United States has its xenophobic and nativist tendencies, the question remains whether neoconservatives can exploit it to win Tea Party support of their foreign policy agenda. This claim of an internal shariah threat will strike many as fanciful as Joseph McCarthy’s charges about communists in the military or the John Birch society’s leader Robert Welch’s claim that Eisenhower was a communist agent. But this doesn’t mean it won’t gain traction, for religious fears are easy to exploit. It is plausible that Gaffney and other neoconservatives consider the “domestic shariah” threat a more viable way to reach nativist Tea Partiers than foreign policy arguments. Once open to neocon thinking, Tea Partiers may then embrace proposals for such military actions as an Israeli war against Lebanon or an American strike against Iran. Judson Phillips, head of the Tea Party Express is a Tea Party leader who seems to have absorbed the religious division argument. Prior to the election, he blogged that Minnesota Democrat congressman Keith Ellison should not be in Congress because he is a Muslim. Many neoconservatives would no doubt consider the bigotry in Phillips’ argument crude. They would nonetheless welcome the defeat of Ellison, one of several congressmen who visited Gaza after the Israeli attack and told Capitol Hill audiences what he saw. Ellison was reelected with 71 percent of his district’s votes. Then there is Newt Gingrich, testing the waters for presidential run. The voluble former GOP House speaker retains some reputation as an “ideas man” in conservative circles. He’s now claiming that freedom in the United States is under a covert threat from radical Islamists wanting to impose shariah law. Liberal columnists have mocked him. Lee Smith, the hawkish Weekly Standard senior editor and Middle East specialist, has ridiculed his argument: “I can’t imagine how he sees this happening, short of the largest land invasion in human history of foreign Muslim soldiers, administrators, and religious scholars with the connivance of millions of Christian, Jewish, Buddhist, and pagan American collaborators.” So Islamophobic craziness is a bridge too far, for at least some neoconservatives. In any case, Rand Paul, unlike his father, does not have an extensive record of foreign policy pronouncements. Many on the libertarian and non-interventionist right hope a Senator Paul might be the reincarnation of Robert Taft, the point man for a more inward looking American Right. Against that possibility, there is the example of George Bush the father and George Bush the son—the son departed from his father’s restrained, establishment-oriented, distant-from-Israel, realist foreign policy and ignited a war prepared for him by the neoconservatives. Then there are figures like Ken Buck of Colorado, who narrowly lost his Senate quest. A small government conservative with Tea Party connections, Buck has voiced skepticism over the idea that the United States can spread democracy to countries like Afghanistan—a widespread sentiment among Tea Partiers. But opposition to “nation-building” may be a red herring. Topping the neoconservative foreign policy agenda is ending Iran’s nuclear capacity, which is more likely to lead the United States and Israel to destroy a country with bombing than to rebuilding failed states. In fact, neoconservatism accommodated itself quite well to the Christian Right—a movement that has failed to achieve any of its programmatic aims, despite being an essential part of the conservative electoral coalition. The Tea Party movement may parallel the growth of the Christian Right, as religious conservatives now comprise its fastest growing element. In all likelihood, “religious” Tea Partiers will be more amenable to Islamophobia-derived arguments than “libertarian” Tea Party members. If that is the case, watch to see if neoconservatives accommodate themselves as easily to the Tea Party as they did to Jerry Falwell and John Hagee. But even if they don’t, the strategy of creating alliances with key Tea Party leaders—as exemplified by the neocons’ treatment of Sarah Palin—seems to be working well. Scott McConnell is a founding editor of The American Conservative and a contributor to Right Web. Michael Gerson, "Will the Tea Party Shift American Foreign Policy?" Washington Post, November 9, 2010, http://www.washingtonpost.com/wp-dyn/content/article/2010/11/08/AR2010110804356.html. Chris Moody, “GOP Congressmen: Most Repubicans Now Think Iraq War was a Mistake,” Cato Library, March 18, 2010, http://www.cato-at-liberty.org/gop-congressmen-most-republicans-now-think-iraq-war-was-a-mistake/. Justin Raimondo, “The New Antiwar Populism,” Antiwar.com, October 4, 2010, http://original.antiwar.com/justin/2010/10/03/the-new-antiwar-populism/. The American Conservative Editors, “An Open Letter to Sarah Palin,” The Conservative, October 6, 2008, http://www.amconmag.com/article/2008/oct/06/00008/. Jennifer Rubin, “Why Jews Hate Palin,” Commentary, January 2010, http://www.commentarymagazine.com/viewarticle.cfm/why-jews-hate-palin-15323. Norman Pdhoretz, “In Defense of Sarah Palin,” Wall Street Journal, March 29, 2010, http://online.wsj.com/article/SB10001424052748703909804575123773804984924.html. David Frum, “YouTube Blogging Palin’s Speech,” Frum Forum, February 8, 2010, http://www.frumforum.com/youtube-blogging-palins-speech. [8 Greg Sargent, “Sarah Palin Advisers Prepped Christine O’Donnell for Debate,” Washington Post, October 14, 2010, http://voices.washingtonpost.com/plum-line/2010/10/sarah_palin_advisers_prepped_c.html. 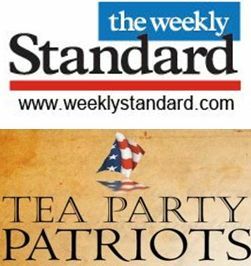 William Kristol, “ The Crisis at Which We Are Arrived: Don’t fear the Tea Parties,” Weekly Standard, July 10, 2010, http://www.weeklystandard.com/articles/crisis-which-we-are-arrived. William Kristol, “Collapse: The left is unpopular, undisciplined, and ill-tempered,” Weekly Standard, August 14, 2010, http://www.weeklystandard.com/articles/collapse. Danielle Pletka and Thomas Donnelly, “Is Freedom’s Price Too High for the Right?” Washington Post, September 24, 2010, http://www.washingtonpost.com/wp-dyn/content/article/2010/09/23/AR2010092305493.html. Arthur C. Brooks, Edwin J. Feulner and William Kriston, “Peace Doesn’t Keep Itself,” Wall Street Journal, October 4, 2010, http://online.wsj.com/article/SB10001424052748704483004575524763315951380.html. Josh Rogin, “The Tea Party’s Hawk,” Foreign Policy’s The Cable, July 1, 2010, http://thecable.foreignpolicy.com/posts/2010/07/01/the_tea_party_s_hawk. Frank Gaffney, “The ‘Peace Through Strength’ Pledge,” Townhall.com, September 27, 2010, http://townhall.com/columnists/FrankGaffney/2010/09/27/the_peace_through_strength_pledge. Matt Duss, “Creeping Sharia ‘Team B’ Report Presented to Congress,” The Wonk Room, September 15, 2010, http://wonkroom.thinkprogress.org/2010/09/15/creeping-sharia-team-b-report-presented-to-congress/. Frank Gaffney, “What I Learned at the Tea Party, Big Peace, October 28, 2010, http://bigpeace.com/fgaffney/2010/10/28/what-i-learned-at-the-tea-party/. Judson Phillips, “Candidates You Need to Know About,” TPN: Tea Party Nation, October 23, 2010, http://www.salon.com/news/politics/war_room/2010/10/26/tea_party_nation_phillips_ellison_muslim/Picture_11.png. Lee Smith, “Lawless,” The Tablet, August 18, 2010. http://www.tabletmag.com/news-and-politics/42898/lawless/. Lydia Alfaro-Gonalez and Erin Robinson, “Hard Line: The Republican Party and U.S. Foreign Policy Since World War II,” The Nixon Center, 2010, http://www.nixoncenter.org/index.cfm?action=showpage&page=Hard-Line-The-Republican-Party-and-US-Foreign-Policy. My Type Blog, October 25, 2010, http://mytype.com/blog/?p=161.